Pathfinder Lester: you’ve got a great place there. Ange Menges: Well before you start, may I announce something ? Pathfinder Lester: Ange, please do. Pathfinder Lester: Nani, from Pandora! Pathfinder Lester: a scavenger hunt! Pathfinder Lester: oh that is fantastic news Ange. thank you for telling us about it. Pathfinder Lester: well, we can have a special HGAC tour for that scavenger hunt, definitely! Pathfinder Lester: scavenger hunts are so much fun. Pathfinder Lester: I’m going to kick things off now. 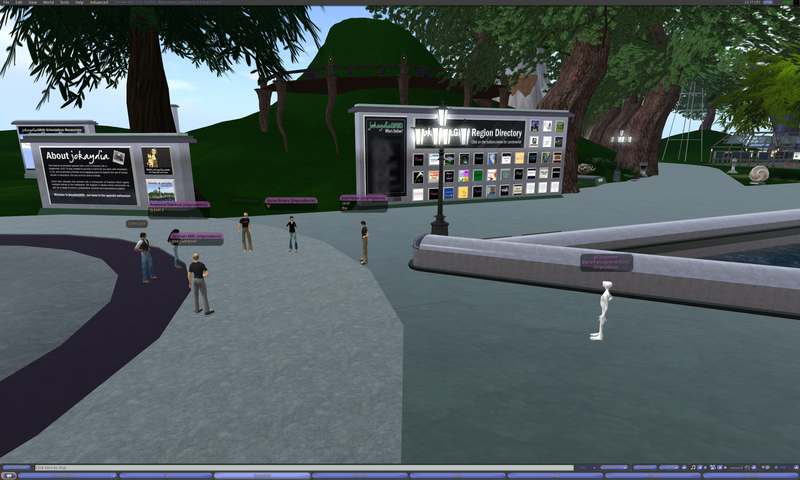 welcome everyone to the Hypergrid Adventurers Club! Raindrops Silvercloud: Hi everyone, sorry for being late, am very excited to read about your project, ange! Pathfinder Lester: thank you all for coming…. Pathfinder Lester: we spend the first 30 min introducing ourselves and having an open discussion…..
Pathfinder Lester: i also post a full report and transcript of every meeting on my blog…. Pathfinder Lester: so if you do NOT want your chat on the blog, please just say so in open chat and I will redact your comments. Pathfinder Lester: please just type in open chat whatever you’d like to introduce yourself and your interests/projects…..
Mimetic Core: can you edit our comments to sound smarter? Pathfinder Lester: and since your chat will be on my blog, you’ll get a wider audience. so feel free to type URLs or whatever you’d like to share with the world. 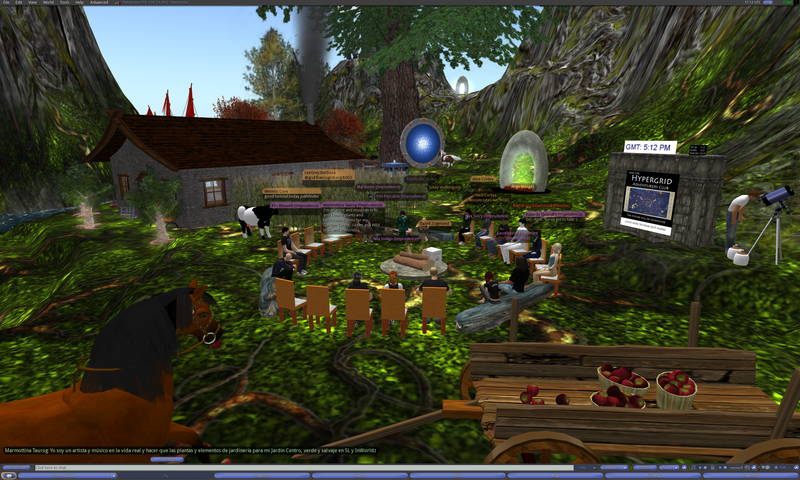 Pathfinder Lester: we’re all introducing ourselves and our interests/projects. feel free to jump in. everyone can type at the same time. Pathfinder Lester: I am going to hand out a notecard to everyone while you talk and introduce yourselves. Aloe Cortex: I’m a sociologist with interests in technology and social change. 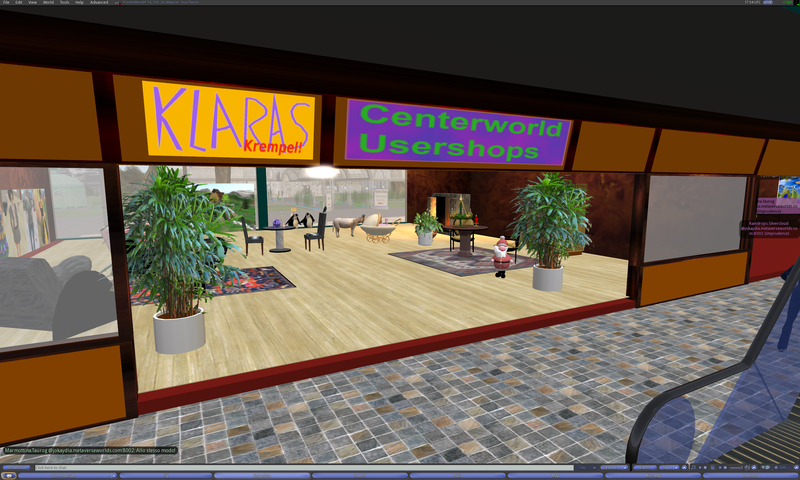 Da5id Zsigmond: Hi – my first meeting – I’m an SL builder and scripter, etc.. My first foray into Open Sim was getting a terraforming and landscaping job here in Jokaydia. Da5id Zsigmond: Never tried the HyperGrid yet. Pathfinder Lester: Raindrops, please email me later at pathfinder@reactiongrid.com. 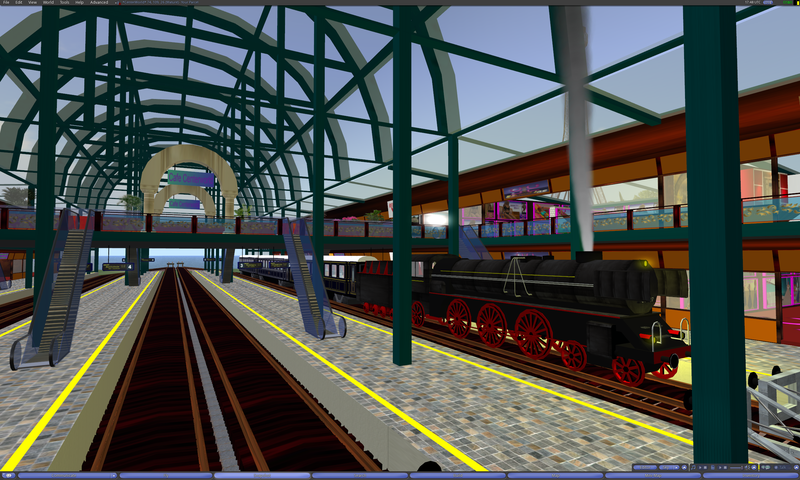 I know some folks working on amazing geometry projects in OpenSim. Happy to connect you to them. Pathfinder Lester: Neo, oh cool! 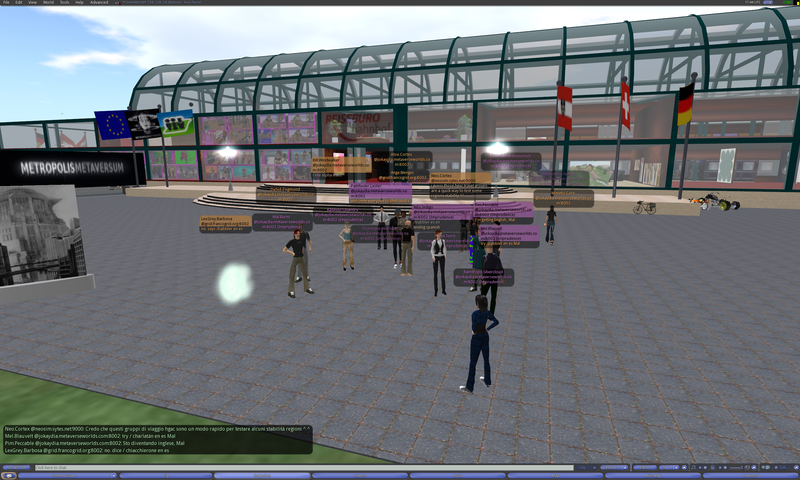 so you made a Hypergrid jump from your own personal Opensim installation! Pathfinder Lester: To all the new folks here, welcome! It’s great to see new people at these meetings. Pathfinder Lester: And if you’re new, please take a look at that notecard right now. Marmottina Taurog: I couldn’t even get that far ! Pathfinder Lester: you’ll see at the top that I mention that you have to have set your Home location and relogged since then in order to make any Hypergrid jumps. Pathfinder Lester: you can set your Home to here and relog if you wish. Marmottina Taurog: do we need to do it every time or just the once ? Pathfinder Lester: before we start on our tour, does anyone have any questions or comments they’d like to share? Pathfinder Lester: just jump right in. we’re not formal here. Da5id Zsigmond: a lot of my questions have been around inventory transfer between grids. Da5id Zsigmond: seems pretty awkward so far. Pathfinder Lester: what do you mean by awkward? Da5id Zsigmond: pretty nearly impossible. Da5id Zsigmond: In theory anyway, should my inventory be available while using the hypergrid?? Pathfinder Lester: Ah, yes, sometimes things you pick up on other grids get “lost” or are slow to rez. Pathfinder Lester: if you try picking up a bunch of different things quickly while you are hypergridding…. Pathfinder Lester: that sometimes causes problems. so I recommend picking things up one at a time and kind of slowly. Pathfinder Lester: Bill, oh great! Pathfinder Lester: Bill, did you want to introduce yourself to the group? Pathfinder Lester: we were just going around talking about our background and interests/projects. Da5id Zsigmond: we can talk about 6502 machine code lol. 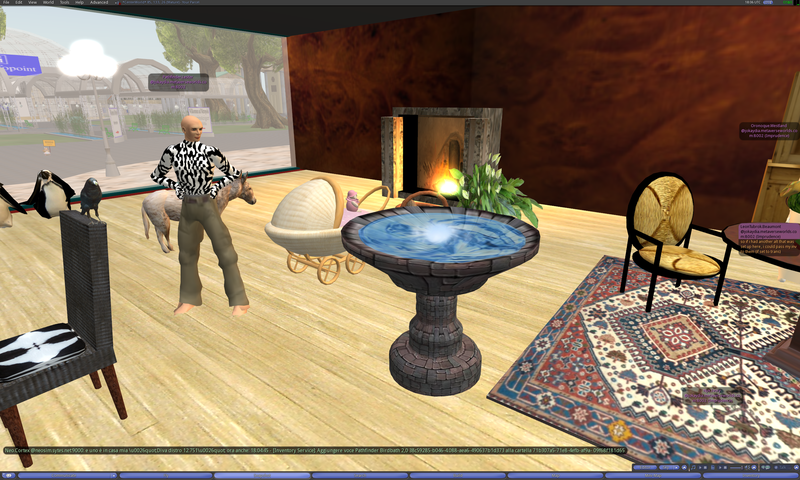 Pathfinder Lester: Bill, wow, so you’ve seen a LOT of change in virtual worlds over the years. Pathfinder Lester: Bill, you’d have a lot to talk about with Cube Inada, who was our guest at our last HGAC meeting. Pathfinder Lester: we’re going to visit a german grid called Metropolis…..
Pathfinder Lester: I don’t know anyone from that grid, so we’ll all be trailblazers today. Marmottina Taurog: sounds good ! Pathfinder Lester: Mimetic, oh cool! Pathfinder Lester: well, well be making two jumps today. Pathfinder Lester: we’ll use one of the instant hypergates to jump from here (jokaydiagrid) to ReactionGrid…. Pathfinder Lester: Nyx, then it will be an adventure! Da5id Zsigmond: still a virgin. Pathfinder Lester: ok, everyone have the notecard? 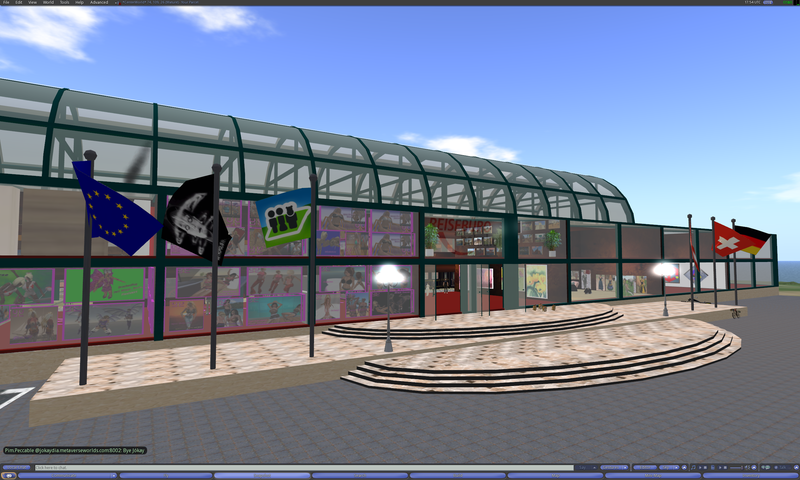 Once we arrive at “*CenterWorld*” we’ll explore the train station and freebie market on this German grid. Look for the nice examples of classic german homes and architecture. Bill Windwalker: is it a cross link like back in 2005 ? Pathfinder Lester: Bill, what to you mean? We walk through an instant Hypergate to make a Hypergrid jump from the region Pathlandia on jokaydiaGRID. Aloe.Cortex: probably shouldn’t all do it at once, should we? LeonTubrok.Beaumont: so where are we now, wich VW? Pathfinder.Lester: and now we’re going to jump from ReactionGrid to Metropolis grid. LeonTubrok.Beaumont: so this is a holding place for transfer? Pathfinder.Lester: Leon, it’s a waypoint, yes. 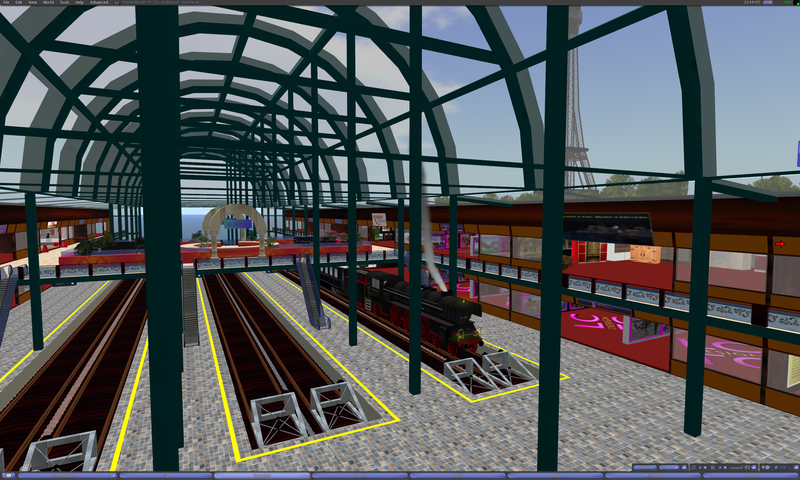 Pathfinder.Lester: we can’t jump directly from jokaydiagrid to Metropolis because it is too far away on the Hypergrid. 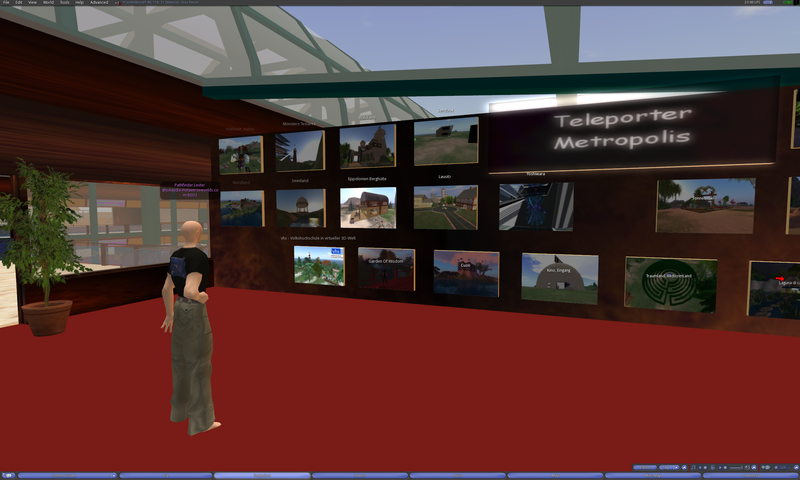 We make a manual Hypergrid jump and arrive on the region *CenterWorld* on Metropolis grid. Nyx.Ivory: do landmarks work acroos grids? Pathfinder.Lester: landmarks only work within the same grid. Pathfinder.Lester: so you all might want to just come back int he future when it is not so busy! Pathfinder.Lester: we should rename our club. Pathfinder.Lester: you’ll find some freebie stores here. and remember, you can explore this whole grid. next time you come here, try regular tps to the other regions. Mimetic.Core: if anyone is interested, you can check out my region – named “doppelganger”. it’s just a workspace that mirrors wjhat i’m building elsewhere. 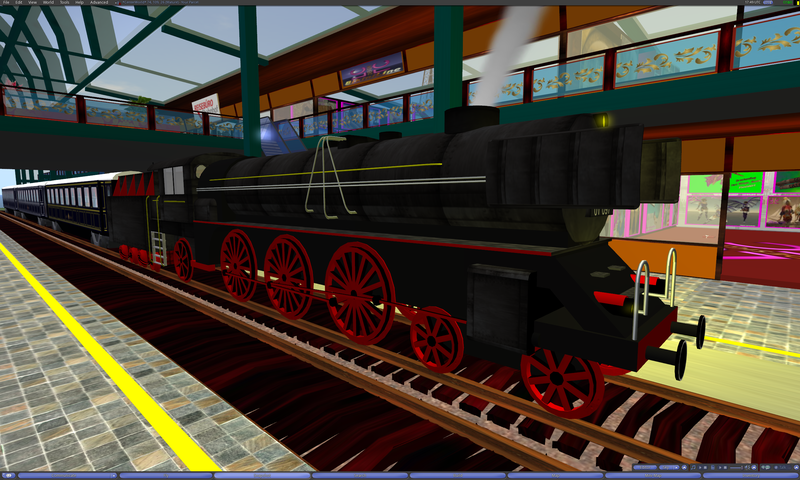 Pim.Peccable: What time is the Hogwarts Express? Marmottina.Taurog: I have to disappear, Thanks for another interesting journey Pathfinder ! Bye to everyone ! Pathfinder.Lester: ooh, a nice raven freebie! 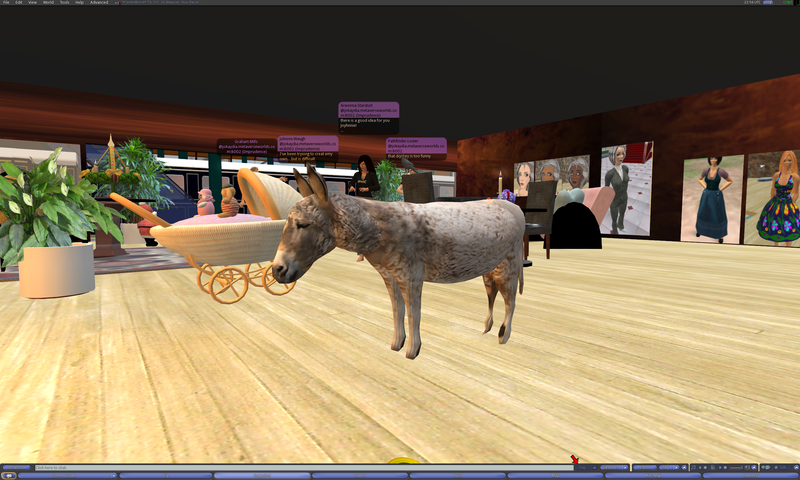 Nila.Indigo: free donkey?? I want one! Nila.Indigo: interesting assortment of items – penguins too? 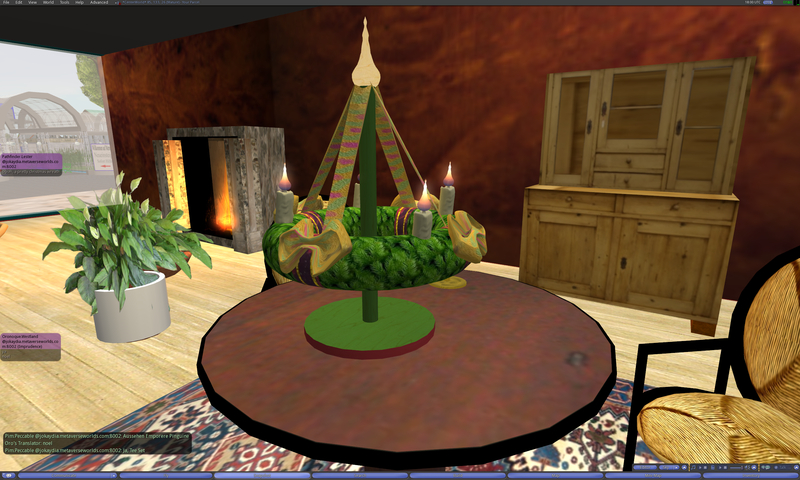 LeonTubrok.Beaumont: so are we using jokadia asset servers now but logged in here? Pathfinder.Lester: if you take something into your inventory, it will be with you always. Pathfinder.Lester: it’s like you have a wormhole back to jokaydiagrid. Mel.Blauvelt: to what extent does RG have access to the Jokaydia grid asset server Path? Pathfinder.Lester: your inventory lives on the grid where your avatar was created. Pathfinder.Lester: Mel, well, jokaydiagrid is a grid hosted on ReactionGrid’s hardware…. Pathfinder.Lester: but jokaydiagrid it it’s own grid fully. 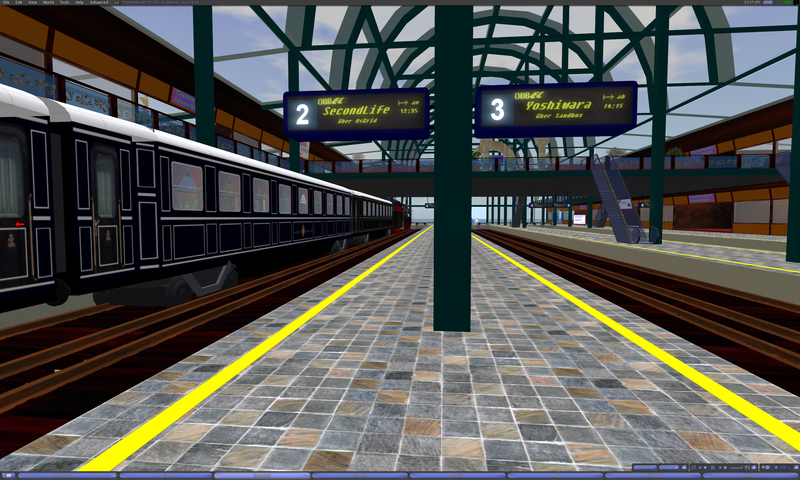 Pathfinder.Lester: so it has it’s own asset server. 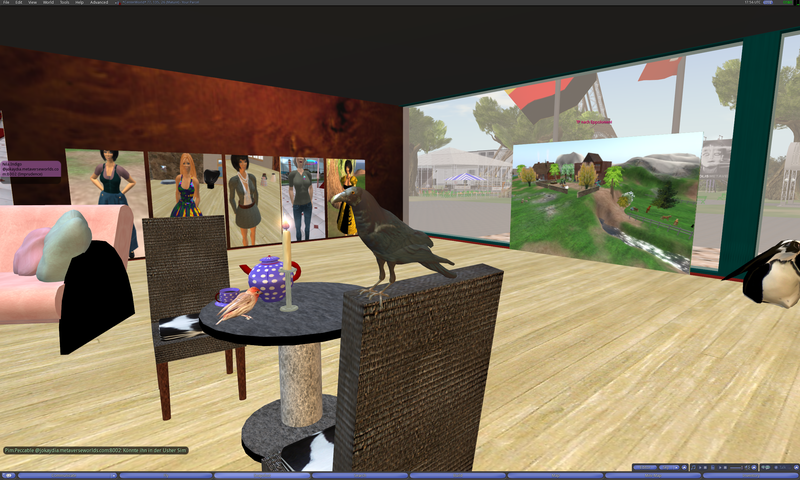 Nyx.Ivory: today i was able to get my jokay avi to Reaction grid – but not my RG avi to Jokay – was that just a hiccup? Pathfinder.Lester: this region seems happier now. not so much lag for me. Pathfinder.Lester: and whenever I find a place that has freebies, and allows rezzing, i always like to leave something of mine. Pathfinder.Lester: lara, you are local to Metropolis? LeonTubrok.Beaumont: so hypergrid wouldnt work on a standalone OS? Pim.Peccable: is Pandora a group here in Metropolis? lara sanders: bist du neu hier? 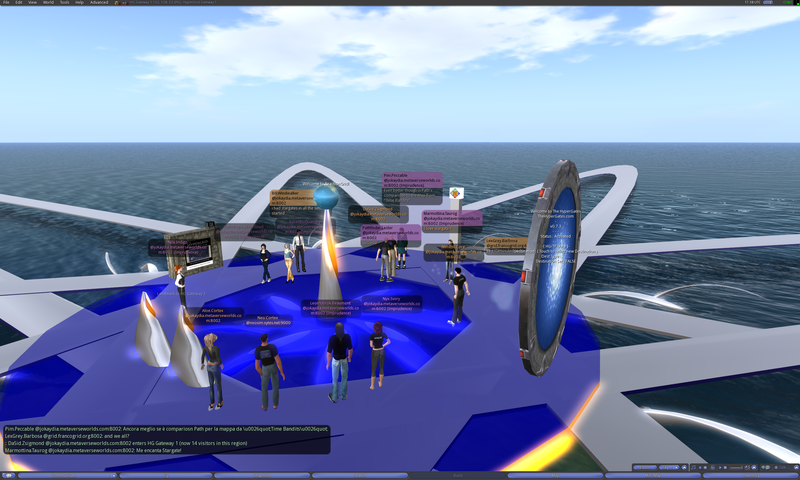 Pathfinder.Lester: we are all explorers of the Hypergrid! Pathfinder.Lester: i will leave a babbler box in the freebie store downstairs. Pathfinder.Lester: lara, how long have you been on Metropolis? Pathfinder.Lester: do you have your own region here? Pathfinder.Lester: Neo, yes. it is very useful. Pathfinder.Lester: yes, it only translates what the wearer says in chat. Pathfinder.Lester: it does not translate what other people say. Pathfinder.Lester: Neo, really? i have not used that. Pathfinder.Lester: i will have to explore how to use that. thank you for the information, Neo. Pathfinder.Lester: we had about 20 people here a few minutes ago. Pathfinder.Lester: so other people can understand us. Pathfinder.Lester: babbler only works with short sentences. Raindrops.Silvercloud: hi brunhild, sorry for not noticing, got lost with all those destinations here! Pathfinder.Lester: Brunhild, what is “Pandora 5” ? Pathfinder.Lester: Oh Raindrops, i love that bird on your shoulder! Raindrops.Silvercloud: lol, got that from the freebie store downstairs – it’s really swet isnt it? Pim.Peccable: Then you request a premium? Neo.Cortex: Can that be nice! Brunhild Messerchmitt: what you mean thit “premium”? Pathfinder.Lester: your english is fine, Brunhild. thank you for speaking it for us. Pim.Peccable: Then what changes after 3 months? Pathfinder.Lester: i have been putting some freebie items in the store downstairs. I hope that is ok.
Pathfinder.Lester: i like to leave freebies whenever i find some. Pathfinder.Lester: everything i left should be full perm. Pathfinder.Lester: alles, was ich links sollte Full Perm werden. Pathfinder.Lester: Ich habe gerade überprüft. Pathfinder.Lester: does it cost anything to have a shop here? Pathfinder.Lester: Brunhild, i would like to get a shop here. Who should I speak with to arrange that? Pathfinder.Lester: so i can just choose an empy store and just start building? Pathfinder.Lester: do you have lena’s email address? That’s the end of our first meeting on Sunday. Here’s our second meeting. Pathlandia was in the middle of rebooting, so we gathered on the region Scooter on jokaydiaGRID. Cider Jack: seems as good as any! Pathfinder Lester: directly to pathlandia. 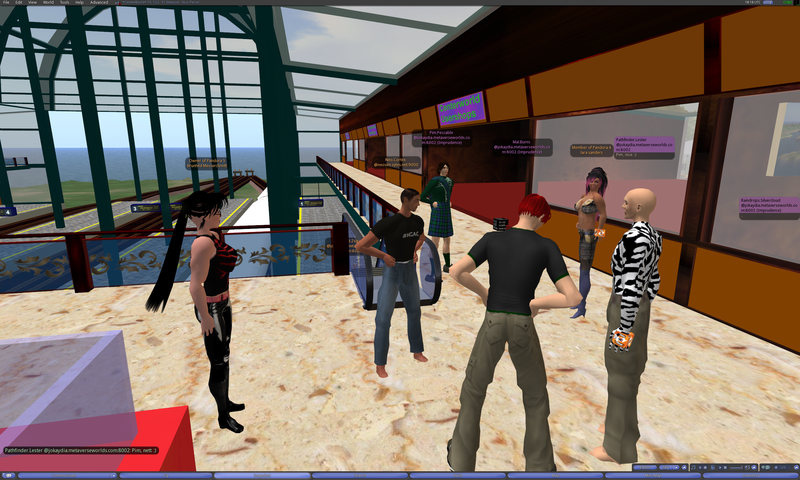 Pathfinder Lester: well, welcome everyone to the Hypergrid Adventurers Club. Susan Briere: It’s part of being an adventurer, Pathfinder. Pathfinder Lester: i blog our transcripts, so if you don’t want your chat on my blog, please just say so. Susan Briere: I guess you could say I’m a virtual vagabond at this time. I’m exploring.. looking for a place to set down some roots. I’d like to be involved in ed-tech initiatives as I am provide technical support to K-12 schools in RL. Pathfinder Lester: Joel, did you introduce yourself while I was gone? Pathfinder Lester: could you type that again so i have it for the chatlog? Arwenna Stardust: too early on a Monday morning for typing accurately! Arwenna Stardust: could be an interesting avatar! Arwenna Stardust: is that named from the film Path? Pathfinder Lester: if anyone does not have the notecard I handed out, please let me know. Arwenna Stardust: so has Metropolis recovered from your earlier excursions Pathfinder? Arwenna Stardust: not surprising – it still amazes me that we can do it at all! Pathfinder Lester: so in the notecard, it says we’re going to use a hypergate on pathlandia for the first jump…. Pathfinder Lester: everyone try to jump to that first point. i’ll wait to see if you make it. We all make a manual Hypergrid jump to the region HG Gateway 1 on ReactionGrid. 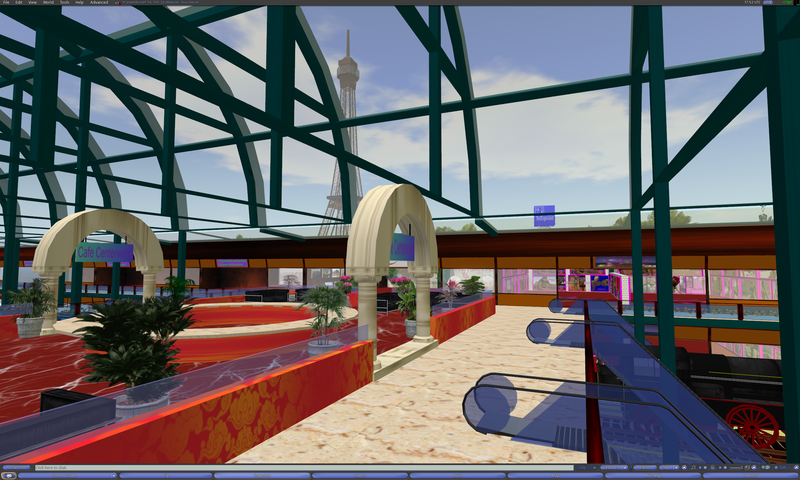 Then we all make a manual Hypergrid jump to the region *CenterWorld* on Metropolis grid. Lena Vanilli: and you are performing travels to different grids? Pathfinder.Lester: Lena, yes. every week we go to different grids. Susan.Briere: What is the tower to the south? Susan.Briere: The tall skinny tower. with the lady on top? 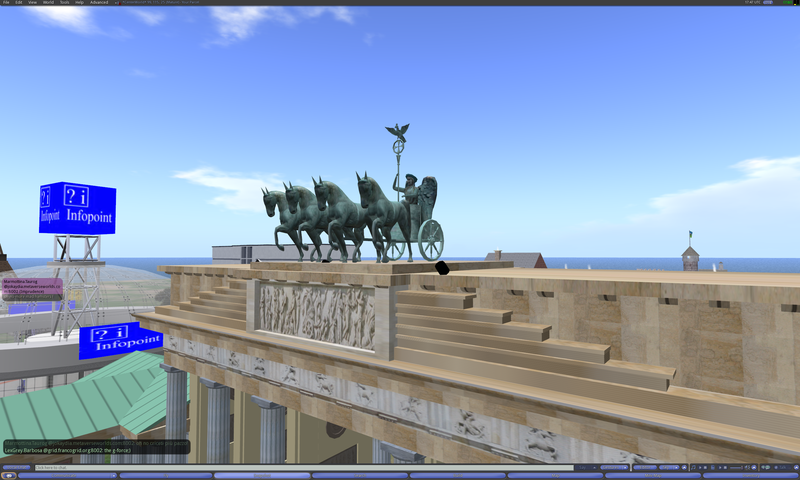 Lena Vanilli: oror the brandenburger tor from berlin ??? Lena Vanilli: may i make a suggestion for your visit? Susan.Briere: Would it possible to share landmarks to each so that we might visit them all in good time? 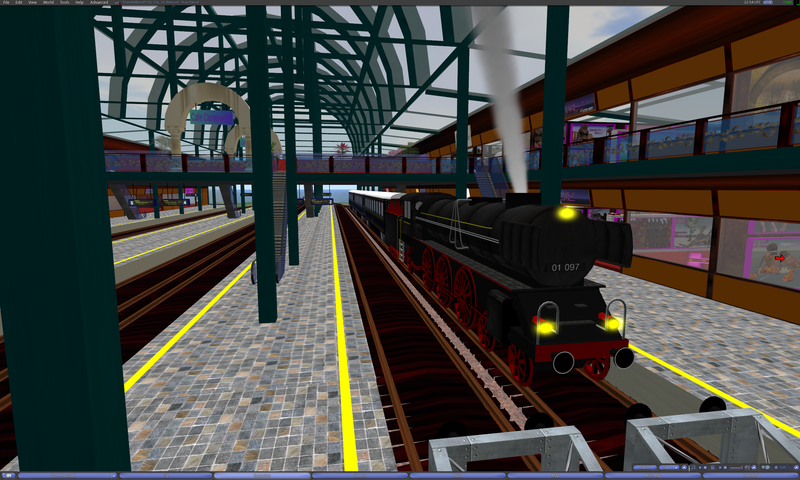 Pathfinder.Lester: Johnnie, the hypergrid tubes get crossed sometimes? Cider.Jack: wow, is Zittau on the grid? Pathfinder.Lester: Lena,if you have time, why don’t you pick a place you would really like to show us and we can go there? Joel.Foner: path, if you add friends from anothergrid, can you only talk to them when you’re on that grid? Pathfinder.Lester: friendships don’t work across the hypergrid yet. Lena Vanilli: did you hear about it? Susan.Briere: What is the c.a.r.p project, Lena? Susan.Briere: Ooohh, that sounds terrific. Arwenna.Stardust: mainly music Lena ? or other things too? Pathfinder.Lester: take care, Lena. hope to see you again soon!! Pathfinder.Lester: Johnnie, none to my knowledge. Arwenna.Stardust: there is a good idea for you Joyhnnie! Arwenna.Stardust: dont fall asleep Path! Arwenna.Stardust: suitable interview clothes for students to choose from – these look possible! Pathfinder.Lester: hope this was fun! Pathfinder.Lester: i’ll do more exploring here and will make sure we have landmarks to them all. Arwenna.Stardust: and buye Path – thanks as always! This entry was posted in Announcements, Avatars, Hypergrid Adventurers Club, Virtual Worlds and tagged avatars, education, german, HyperGate, HyperGrid, jokaydiagrid, metaverse, metropolis, metropolis metaversum, online communities, OpenSim, ReactionGrid, virtual worlds by John "Pathfinder" Lester. Bookmark the permalink.